Murder is a very nasty business, something that is rarely communicated in movies. In films the destruction of another human being is usually little more than a plot device, a narrative disruption or a short-cut route to demonising the bad guy. The rise in popularity of the serial killer movie in recent years in particular has seen murder, torture and even mutilation employed for dark thrills, to disturb its audience without actually confronting the grubby reality of what taking a life involves. It was the desire to approach this head on that led Hitchcock to create the most memorable sequence in Torn Curtain, a bravura scene that is a nonetheless still a very stylised one, an accusation that could not be thrown at key sequences of Krzysztof Kieslowski's A Short Film About Killing (1998), one of the most successful cinematic attempts to deglamorise the act of murder. Vengeance is Mine is on the surface a serial killer film. It was made some time before the recent Hollywood run that was kicked off by Silence of the Lambs and creatively peaked with Se7en, but some years after pioneering genre films A Kiss Before Dying (1951), The Boston Strangler (1968), Peeping Tom (1960), Psycho (1960) and 10 Rillington Place (1971). The film aligns itself with these earlier works by following the activities of the killer rather than the investigation to track him down, but stylistically it is very much out on its own. Directed by Imamura Shôhei and based on the true story of Nishiguchi Akira, who was arrested in 1964 after a country-wide killing spree, the film follows the renamed Enokizu Iwao as he travels across Japan, living off fraud and deception and committing a string of callous murders, narratively hopping back to include his problematic pre-war childhood and post-war youth and his acrimonious relationship with his devoutly Catholic father. In its content, its character detail and its narrative structure, the film's approach to its subject matter is complex, confrontational and meticulous. Kicking off with Iwao's transportation to the police station following his arrest, the story initially unfolds in disarmingly non-linear fashion, hopping back and forth through time and not always with graphical assistance to specify the current date and place. The discovery of the first body, for example, comes after Iwao's capture but very shortly before we are shown the events leading up to the murder itself. 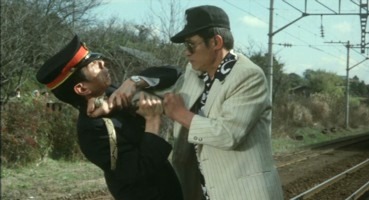 Occurring early in the narrative, this is not a slickly executed killing in the mode of modern mainstream thrillers, but a clumsy, amateurish and deliberately unpleasant mess – the failure of Iwao's attempts to club his victim unconscious with a hammer force him to resort to a stiletto knife, which is thrust violently into the chest of a man who just will not lay down and die. It's a shocking scene and for all the right reasons. We should be horrified by it, appalled by it – there is nothing even darkly thrilling about this death and it feels sickeningly real. The effect on our perception of Iwao is immediate, and when a short while later he nips into a store to buy a kitchen knife (that he selects the cheapest one is an interesting detail in itself), this simple act provokes a shiver of fear at what he will do with his purchase. A second murder soon follows, one every bit as unpleasant to watch as the first, and from that point even the threat of violence on Iwao's part has you on edge. You don't want to see another person die on screen, not like this. Good. Now we're starting to comprehend what murder really means. As the flashback narrative becomes more linear in structure, the character of Iwao himself is considerably expanded on, his back story providing a clearer picture (if no real understanding) of the route that led from rebellious child to destructive adult. Crucially, although Iwao is always interesting he is never likeable. Openly contemptuous of his father Shizuo from an early age but doting on his mother Kayo, he cavorts with American servicemen and joins them in intimidating local girls, ridicules a traditional marriage and instead weds his pregnant girlfriend Kazuko, then spends two years banged up for stealing an American army jeep. Having established Iwao as the subject of his film, Imamura then wrong foots us by all but ignoring him to concentrate on the relationship that struggles to develop between his young wife and his elderly father, first signified in an erotically charged scene in an on-sen bath. But even this story strand moves forward in unexpected ways, as Shizuo pimps Kazuko to a local railway worker, a situation she willingly accepts because of her devotion to a father-in-law whose devout Catholic beliefs prevent him from acting on his desires. Iwao emerges from jail as unpleasant as ever, but the prospect of him giving the railway worker a sound kicking does have its up side, a pay-off we are cheated out of when Iwao chooses to extort money from him instead, his first step towards what earlier in the film (but later in the story) seems an inexplicable motive for murder. This proves a major turning point for both the film and for Iwao, as he abandons the wife and father he cares little for and finds a new home up north in Hanamatsu with Inn owner Asano, for whom he develops some genuine affection. But as the murders continue and his face becomes more recognisable, the most honest relationship he has is with Asano's mother, herself a convicted killer recently released from prison. In one of the film's most extraordinary moments, Asano is sexually assaulted by her landlord as two near-distraught murderers stand hidden in the kitchen, one silently dissuading the other from slaughtering the man. It is at this precise moment that the unexpected happens and we connect emotionally with Iwao, sharing his anger and longing for the mother to let him run in and kill the landlord. It's an all-too-brief respite, a small flash of humanity before Iwao falls back into his old ways and develops what increasingly appears to be an acceptance of his own inevitable capture and execution. Repeatedly the film takes us to surprising and disturbing places and never provides easy visceral thrills. Much of the later violence occurs outside of the narrative and occasionally plays games with our expectations, as with the two women that we are sure Iwao is about to throw from a boat but whom he is in fact setting up as witnesses to his own faked suicide, or when Iwao buys a hammer and nails to do who knows what to a man we know he intends to kill, only to reveal that the deed has already been done and that the tools are required to secure the victim inside a wardrobe. Significantly, Iwao is not the only one capable of emotional or physical cruelty to others, a narrative sidebar which is at its most disturbing in the particularly unpleasant killing of a dog by Shizuo and Kazuko, a scene you'll be glad occurs off-screen. As if the story itself were not busy enough, Imaura also includes some intriguing references to less discussed aspects of Japanese society. A prime example involves the discovery of the first body on an allotment, a scene that begins with an old woman throwing stones at something that is hidden from our view. Into the frame shuffles an equally aged friend, to whom she complains contemptuously about "a drunken Korean" who has fallen asleep amongst the greenery. The friend investigates and finds instead the body of a murder victim. She cries out in horror, but instead of announcing that the man is dead, she says, "He's not Korean! He's Japanese!" When I first saw the film, some years ago, this moment passed by me largely unnoticed, but after some years of visiting Japan, especially rural Japan and the on-sen spring baths that figure in the story here, I became aware of this sometimes hostile racial prejudice that is still held by a number of the older generation of Japanese. At its worst it can be genuinely unpleasant to deal with, akin to the sort of nonsense spouted by the more ignorant English about those of Middle Eastern, Pakistani or Indian descent. It's an element of Japanese society, admittedly a small one, that never turns up in either the stereotypical portrayals found in the likes of Lost in Translation or the noble warriors of The Last Samurai. And yet here it is, openly alluded to in just one line of dialogue, but a line that carries with it considerable social and subtextual weight, another level of layering that makes Imamura's film such compelling viewing. And compelling it is, for its documentary realism, for its complex but gripping storytelling technique, for Ogata Ken's magnificent central performance, for its non-judgemental approach to consistently troubling material, and for its intellectual and emotional depth. Imamura even has the balls to end the film on a scene of surrealistic peculiarity that nonetheless works perfectly for the film, precisely because of its possible subtextual readings. Vengeance is Mine is genuinely great cinema, challenging, intelligent and confrontational, a brilliantly told and beautifully handled story that unflinchingly explores the darker side of human nature and neither celebrates nor apologises for it. That doesn't always make it easy viewing, but does make for a most memorable and satisfying film experience. My first experience of Vengeance is Mine was a grubby 4:3 TV print that was further punished by its VHS tape storage. The opening night-time scene of Iwao's arrest motorcade in particular was almost impossible to make out, the decision to shoot in largely natural light throwing up all sorts of clarity issues. The good people at Eureka had promised a transfer that would transform the film and they weren't kidding – framed at 1.78:1 and anamorphically enhanced, the print may have a few dust spots but is in just about every other way first rate, coping splendidly with the sometimes dour lighting and earthy interiors, and at its best demonstrating very good contrast and detail. Black levels are largely solid and shadow detail is better than expected. Even night shots look good and display a level of detail and stability that you simply would not expect in such dimly lit sequences. The mono soundtrack is clear and noise free, but the dynamic range is a tad restricted, the trebles being a little crisp in places, reminding me more of soundtracks from the late 60s rather than a film made in 1979. I've no complaints, though. As with several of Eureka's recent issues of Japanese classics, there is an introduction by Alex Cox (6:36), who outlines some of the more notable qualities of the film and gives a brief summary of Imamura's career. The key extra has to be a commentary by Tony Rayns, one of the UK's most respected writers on Asian cinema and a man whose work I usually find essential reading. He supplies a fair amount of background on the film and Imamura himself, including some very interesting excepts from a workshop he himself hosted with Imamura. Some contextual historical and cultural information is provided, much of which could prove useful to those not familiar with Japanese society, but there are also a number of stretches where Rayns simply describes what is happening on screen and the reasons for the actions of the characters, all of which should be somewhat obvious to most viewers. Finally we have another of Eureka's very fine booklets, containing stills from the film, containing a new essay by midnighteye.com's Jasper Sharp, a rather more academic essay by Dr. Alastair Phillips of the University of Reading and, best of all, reprints of pages from the original Shochiku 1979 International film brochure, which includes a piece by Imamura on the film and a map detailing Iwao's cross-country progress. Imamura Shohei is widely acknowledged to be one of cinema's true masters, and in Japan is held in enormously high regard both by cineastes and the upcoming generation of film-makers. Two years ago I visited the Japan Film Academy that he founded, now located on the outskirts of Tokyo, where his works are revered by staff and students alike, and was recently sent a handsome brochure by a good friend who works there, detailing an in-depth retrospective of his work that was to be screened in the weeks that followed. Looking at it I became painfully aware of how few of Imamura's films are available in the UK; most will only have caught his 1997 Unagi [The Eel], the 2001 Warm Water Under a Red Bridge [Akai hashi no shita no nurui mizu] and perhaps his 1966 The Pornographers [Jinruigaku nyumon: Erogotshi yori]. The fortunate few will also have seen Vengeance is Mine. If you haven't then you absolutely owe itself to check out this DVD, and even if you have I can almost guarantee you've never seen it looking this good.